For the Greeks, dolphins bring good luck. They discovered these cetaceans’ passion for music: playwrights Euripides and Aristophanes mentioned their attraction to flute melodies. They were known for saving humans from drowning and for being the only creatures capable of loving a man without expecting anything in return. Here are some of the stories about our favorite marine mammals, discover why they’ve been close to us since the ancient times. It is said that the god Bacchus - or Dionysus, deity of wine, the guy whose name we used to name the best parties or 'Bacchanals'- was captured by pirates looking for a large ransom, after being confused with a prince. Dionysus managed to remove his chains, take out his flute and play a sweet melody that made the branches of a vine entwine in the mast of the ship and turn the oars into serpents. The god, turned into a panther, decided to forgive the pirates and transform them into dolphins so that from then on, they would help men instead. This explains why dolphins are attracted to humans, boats and music. According to the ancient tradition, the city of Tarentum was founded by Taras, a Greek who had been saved from a shipwreck by a dolphin sent by his father, Poseidon – none other than the god of the sea. Tarentum, whose foundation was predicted by a Delphic oracle in 8 BC, put several coins in rotation representing Taras riding a dolphin. It would seem that dolphins patrolled the sea to find humans in distress. Do you remember when everyone cried over Hachiko's honorable displays of loyalty to his master, Parker Wilson -played by Richard Gere- in 'Hachi: A Dog’s Tale’? There are stories that suggest that dolphins have a similar feeling towards humans. It is said that Hermias of Iasos used to go swimming every day after training in the gym. He tamed a dolphin that waited for him to go for a ride in the sea. One day, Hermias drowned and the dolphin threw him back to the shore, but it was in vain. Eventually, the pain was too much to bear and he died next to him. Their friendship was commemorated in a statue of the two and some coins of Iasos show Hermias holding the fin of the dolphin and swimming with him. The Greek poet Oppian of Anazarbus wasn’t joking when he said that 'nothing more divine than the dolphins has yet been created’. Although the Greeks paid special tribute to them, Byzantine and Arab sailors, and even Chinese and European explorers, have stories of dolphins coming to the rescue of humans or ships. It was even said that a boat accompanied by dolphins would definitely find a safe harbor and good weather. Like Jack, a late 19th century dolphin who guided ships across a dangerous strait off the coast of Tasmania. If you were worried about the safety or the odds that something could go wrong next time you swim with dolphins in Cancun, you can be sure that they will never let anything bad happen to you, for they have been magnificent guardians since the beginning of times. 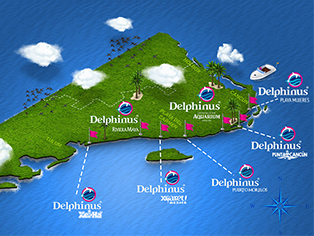 At Delphinus, you can corroborate firsthand all the qualities of our favorite cetaceans mentioned by sailors and ancient civilizations in their stories. Book now!